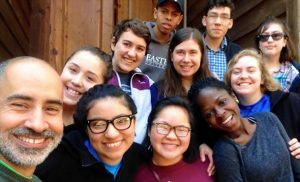 From March 6-10, 2017, Eastern Mennonite University Y-Serve sends four student groups on service learning trips. A special chapel Friday, March 3, at 10 a.m. in Lehman Auditorium, will offer prayers for their safe journeys. Read on to learn more about the history of YPCA/Y-Serve. Visit this link at EMUstories.com, a repository of EMU’s Centennial history and alumni stories, for an in-depth YPCA timeline. If asked to identify the most influential student organization in Eastern Mennonite University’s 100-year history, the answer is easy: the Young People’s Christian Association, known popularly as YPCA or the Y. For many years, the student body and YPCA were one and the same: if you were a student at what was then called Eastern Mennonite School in its earliest years, you were a member of the YPCA. Another difference: the old structures of commissions and committees are gone, replaced by “a more responsive, less obligation-driven structure,” he says. The new Y-Serve continues the important legacy of the YPCA on campus. “There’s a rich history of contributing to this institution’s vibrancy and Christian character,” Burkholder said. That legacy was honored at an 85th anniversary celebration, in which Carmen Schrock-Hurst ’81, who was co-president (with Harry Kraus ’82) from 1980-81 and is now an instructor in the Bible and Religion department, eloquently linked the YPCA of old to its modern membership. EMU Y-Serve participants on the 2016 service trip with Alterna community founder Anton Flores (left) in LaGrange, Georgia. Perhaps at this anniversary celebration it behooves us to ask ‘Why?’ of the Y. Why, when there is pressure to study and work to pay the tuition bills, and infinite opportunities to socialize and participate in extra- curricular activities – why do students consistently continue choose to give of their time and money to keep alive the Y? The answer, she said, is at the heart of what makes EMU unique: a belief in God’s word and the call to find one’s life by losing it. Y participants have exemplified and continue to model the “desire to have education be rooted in the real world and not tucked away in an ivory tower of isolationism,” she said. The organization enveloped all students and infused Christian devotion into every aspect of student life, from planning on-campus ministry activities and social activities to forming a quasi-student government and initiating fundraising efforts to support the school. YPCA also was active in off-campus ministry and service learning trips, which often served the dual purpose of weekend social activities. —From 1922-46, YPCA published the student handbook, a combination rulebook, welcome packet, calendar, and social guide. 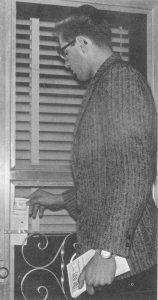 —In 1938, the “Tract Distributors” would, once a month, place a tract on every doorstep in Harrisonburg. It took 36 students a full day to distribute the 1,700 tracts. 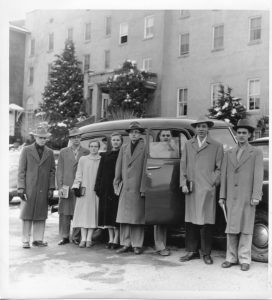 —At least 20 local congregations were either begun or significantly boosted by YPCA students: Beldor, Big Spring, Broad Street, Crossroads, Elkton, Gospel Hill, Morning View, Mt. Hermon, Mt. Jackson, Mt. Vernon, Ridgeway, Staunton, Valley View, and Zion Hill are just a few. —The 1950 Annual Report listed “129 conversions” and “5,690 service opportunities,” with 111 student leaders and two YCPA-owned cars. —YPCA activities and structure provided the foundations for three now-separate student organizations: Campus Activities Council, Celebration, and Peace Fellowship. Many other clubs should also trace their organization’s beginning to the Y, when it filled their roles in slightly different ways when it was the only student led social organization for years. 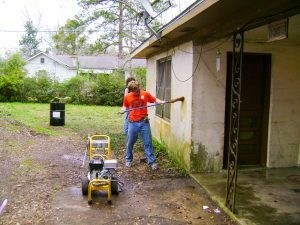 Students work on a home in Mobile, Alabama, with Mennonite Disaster Services. —In the 1980s, the main ministries were the Saturday Adoption Program, Y-Church, Western State mental hospital outreach, Wilson Rehabilitation, Gospel Outreach Teams, Work Teams, and Jail Ministry. —In the 2000s, YPCA launched and strengthened partnerships with ministries including the Virginia Mennonite Relief Sale, Virginia Mennonite Retirement Center, Sharing with Appalachian People, Mennonite Disaster Service, Jubilee Partners, Alterna Community and area Kid’s Clubs. —In 2016, Y-Serve paired with Gospel Choir and the Black Student Union to fund and coordinate a“Civil Rights Tour” through the American South during Spring Break. 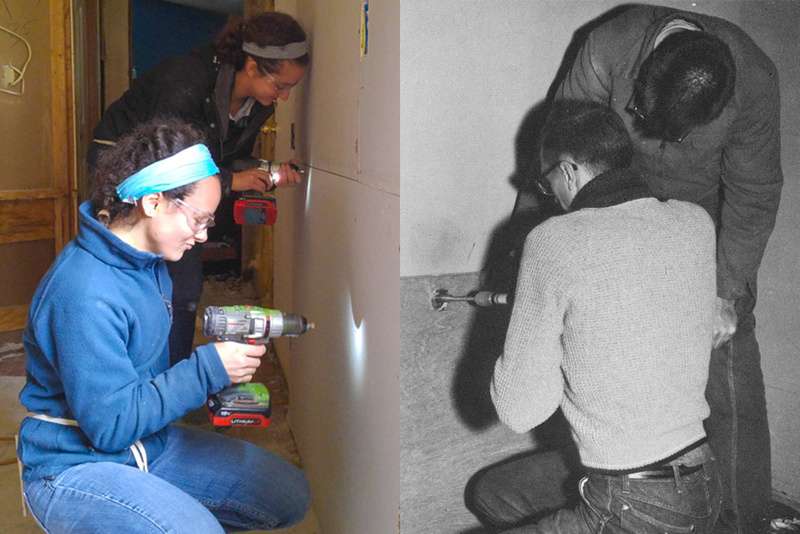 Additionally, four other Y-Serve groups traveled to work sites. Junior Caleb Schrock-Hurst contributed research and analysis to this article. Click here for a timeline of more detail lodged at www.emustories.com, a ‘Centennial celebration of institutional history, including several more fun timelines, and lots of great alumni stories.